This is the third time I ordered frames with him and as always his work and customer services was top-notch! 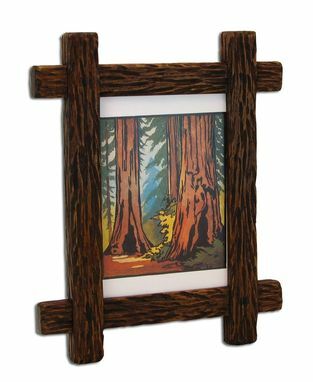 This is a hand carved lap-joined Adirondack style frame perfect for that rustic look and will go great with a western or outdoor theme. It also looks great in a cabin type setting. Constructed of quarter sawn white oak with square pegs that go through the frame to secure the corners. Other wood species available. Many sizes available along with your custom size. The frame shown is 1" wide but any width up to 3.5" can be accommodated. This frame can hang on your wall in either a portrait or landscaped orientation. Dimensions: Dimensions will depend on the size of the frame and the width of the stiles and rails. I had a great experience working with Jim and I love the wood frame - it looks great in my craftsman home. I would definitely recommend him and the website. Wow, wow, wow!! This was my first custommade.com purchase. Jim was extremely professional and easy to work with, and the completed frame is absolutely stunning. Every detail down to the hardware was well-crafted and perfect. 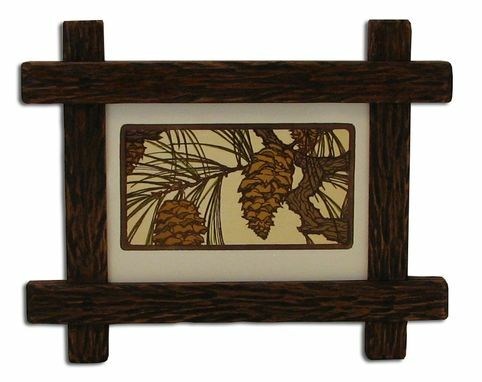 The frame easily holds its own next to my beautiful antique carved frames and I wouldn't hesitate make another purchase from this craftsperson. I only wish I could afford to re-frame everything in my home!